Ever experienced how it feels like when your child accidently deletes all your contacts in a moment and you feel helpless. Well, if you have not, you need not to wait for this bad experience. EaseUS MobiSaver for Android app allows you to recover all your contacts instantly. 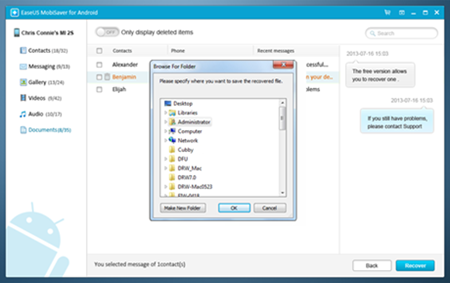 If you have accidently deletes your messages and it contains important information, there is no need to worry about as this software will instantly assist you to recover your data. I remember once I made a video of my best friend’s engagement party and due to not enough space, I had to delete some of my photos from the gallery section to create more space for the video. However, when I transferred the video in my laptop, I conveniently got all my photos recovered from EaseUS MobiSaver for Android. So if you have to delete something in emergency, you can easily do it as you have the software to recover it easily. People who work online must be familiar of how it feels to lose their important documents or getting their documents corrupted for some odd reason. This EaseUS MobiSaver for Android software will allow recovering your lost professional documents efficiently so that you may not have to face any professional trouble. EaseUS MobiSaver for Android works for almost all Android smartphones such as LG, Samsung, HTC, Sony, Google and Motorola. You can also recover data from Android tablets and SD cards. In addition, this software is supported on Windows 10, 8.1, 8, 7, Vista and XP. The free version of the software allows you limited data recovery whereas premium will get you to retrieve unlimited files, lost videos, photos and documents. You can also contact lifetime tech support services if you don’t figure out how to use it on your own. So ready to recover anything with EaseUS MobiSaver for Android software no matter you lost it a month ago or a year ago!